Description: The traiing unit on 39T. Description: Clouds ro no clouds, it doesn't stop me from shooting! Title: Train 252 arriving at Saratoga to make a two unit pick up. Description: Three CP's head through what used to be a yard filled with cars constantly, now only a few industries, a grain elevator, and a few buildings are left. Description: 496 comes up towards the Loop Track at Shoreham, with a pair of GE's that were originally on 330's train leading the way for the rest of the 6 units. Description: This wide angle perspective really shows how long 8 engines actually are! Description: An eastbound kicking up snow after meeting a westbound at Murray siding. Description: Four big CP motors power this morning's #280 through Dresbach. 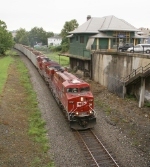 Title: CP 8839 leads No. 281 west toward River Rd. Description: Train 281 has a good consist for its trip to Saint Paul today. CP 6051 is trailing. Description: With shadows already engulfing the left side of the bridge, train 281 races the sun back to Saint Paul with a relatively short train today. Description: On a much nicer morning today, CP train #280 rolls past Bangor WI. Title: CP 8839 Tomah Sub. Description: At 07:00am with a Low Sun , this Engineer Has The Throttle Buried on the 13-Mile long Grade. Description: A short northbound flies down the North End of the D&H towards Rouses Point, where this train will get a fresh crew and will meet Amtraks southbound Adirondack before proceding north to St. Luc Yard in Montreal.